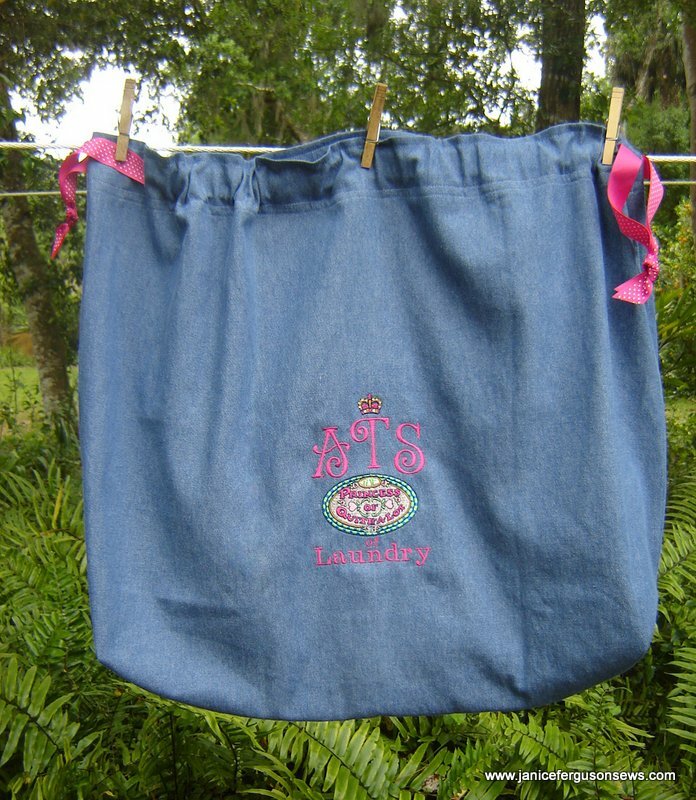 The next project was a denim laundry bag for this lovely, ladylike young lady who is, indeed, Princess of Quite a Lot of Laundry. But she is not at all like this spoiled miss. 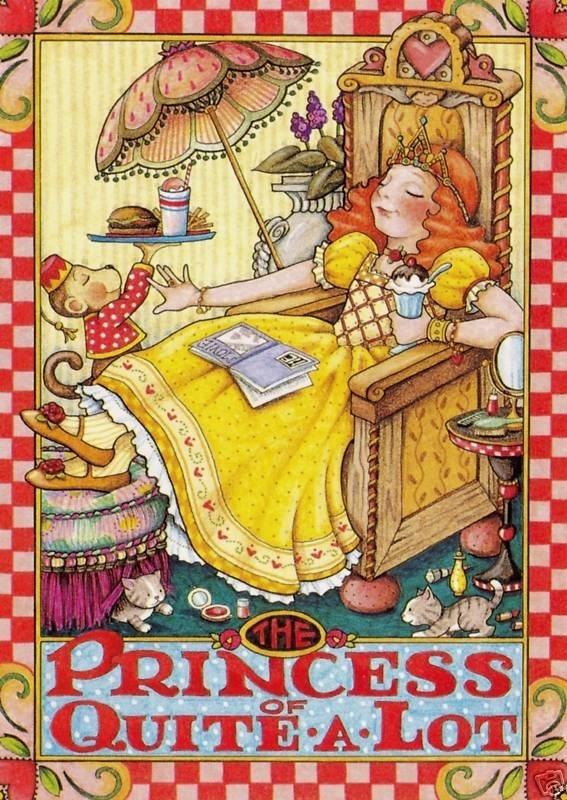 I enjoyed working up this design, beginning with the Princess of Quite a Lot from Mary Engelbreit’s Studio Bernina collection. 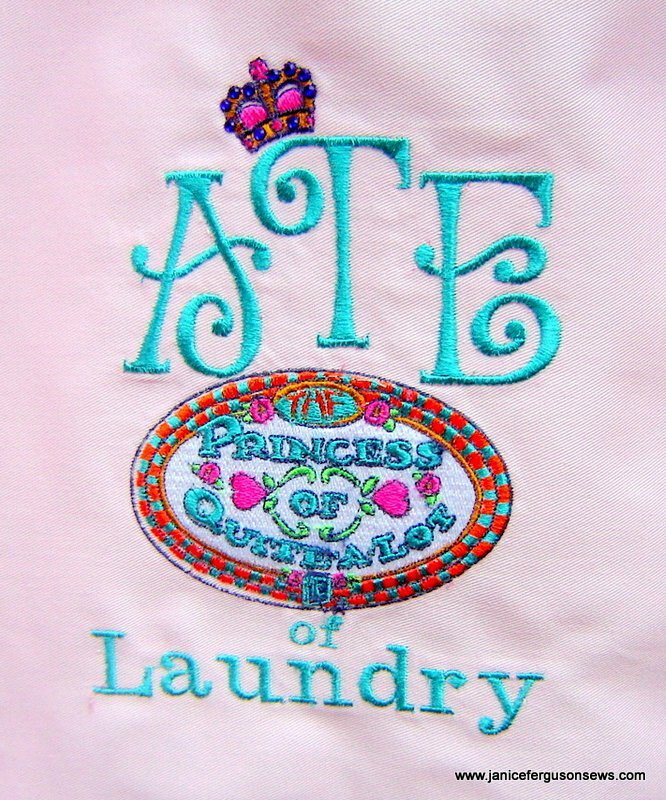 To that design was added the text “of Laundry,” Alexa’s monogram and a crown embellished with heat fix crystals. The monogram font is Embroitique’s Beanie Alphabet. 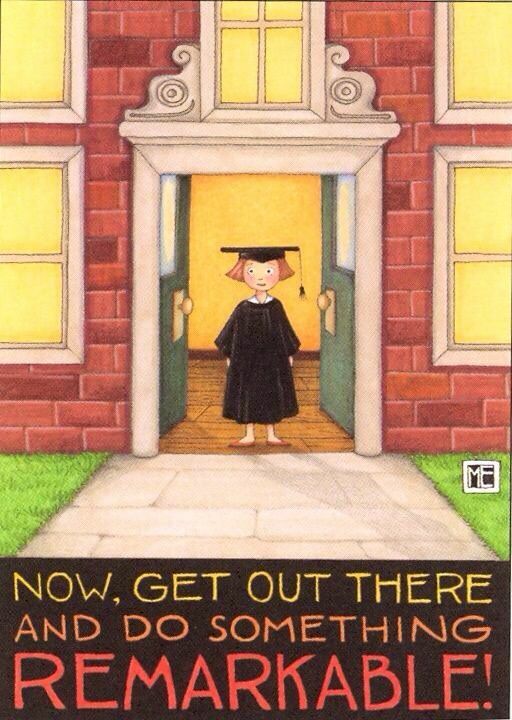 So now she is all set to graduate high school and move on to the next chapter in her life. Then, loving grandmother that she is, Rheeta did not want little sister Adriana to be left out so a similar one was made from a heavy pink twill. Since she was a little girl, Adriana has had a playful look of mischief in her eyes. Placing her princess crown slightly askew just seemed appropriate for her impish personality. 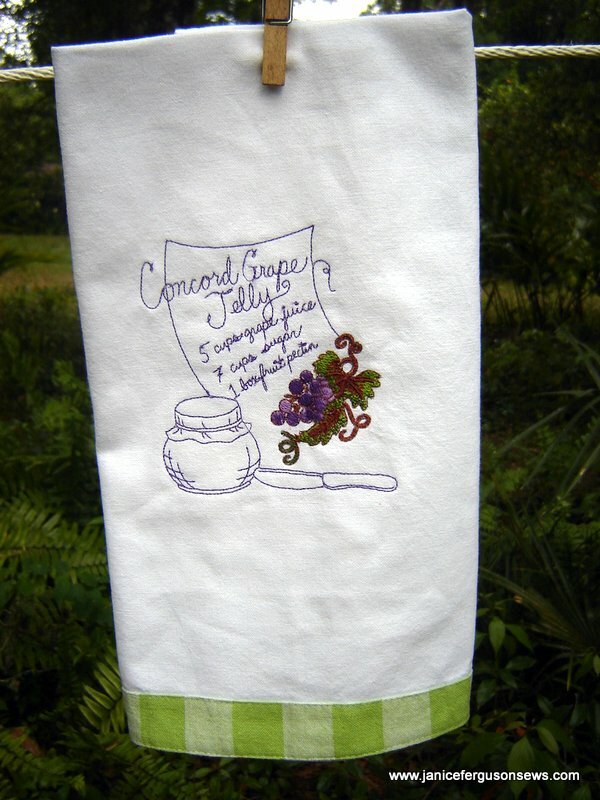 With her granddaughters’ projects completed, Rheeta made a set of dish towels for her daughter’s new home. 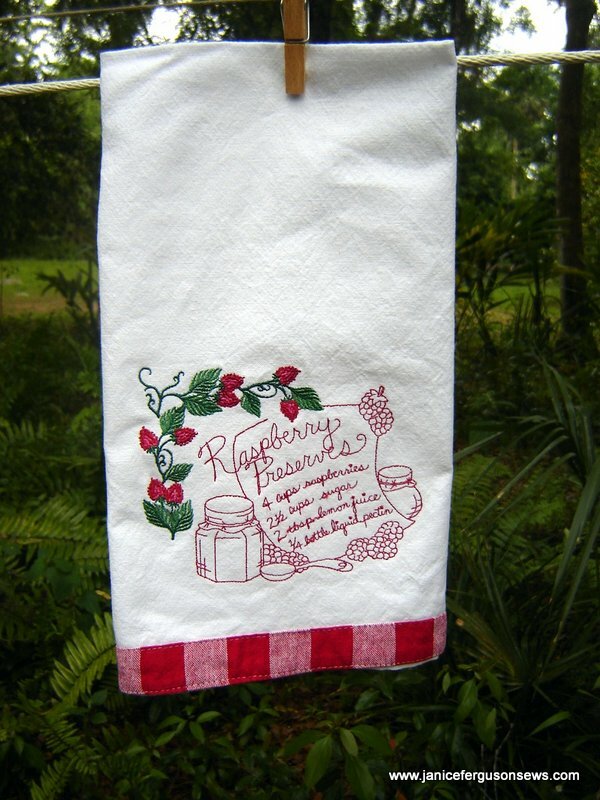 The redwork recipe designs are from Embroidery Library’s Spread the Love collection, but filled fruit designs have been added from various other sites. 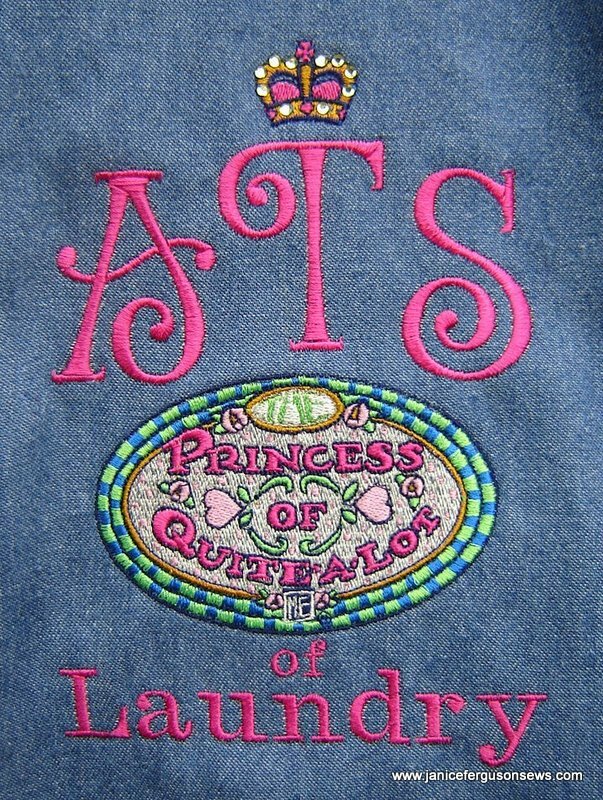 The towels are my favorites from All About Blanks. I keep a hefty supply on hand, washed and ironed, ready for embroidery. Finally, she was ready to make something for herself. A beautiful set of 8 embroidered coasters was finished and packed before we thought about getting a photo. 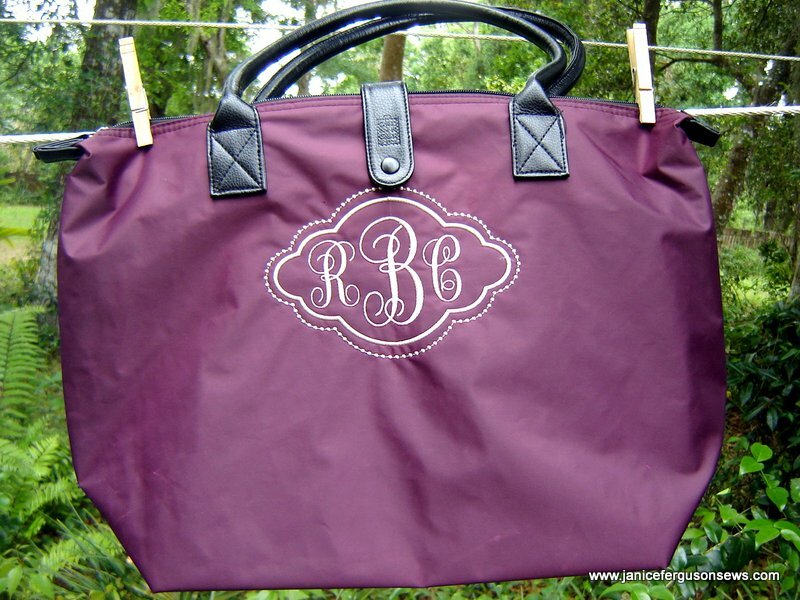 After that a monogrammed tote bag was on the agenda. The monogram is Embroitique’s Fancy Monogram 1, the frame is Planet Applique’s Kaleigh, minus the applique. That was hard! My Rebecca had given Rheeta one of her bargain totes. 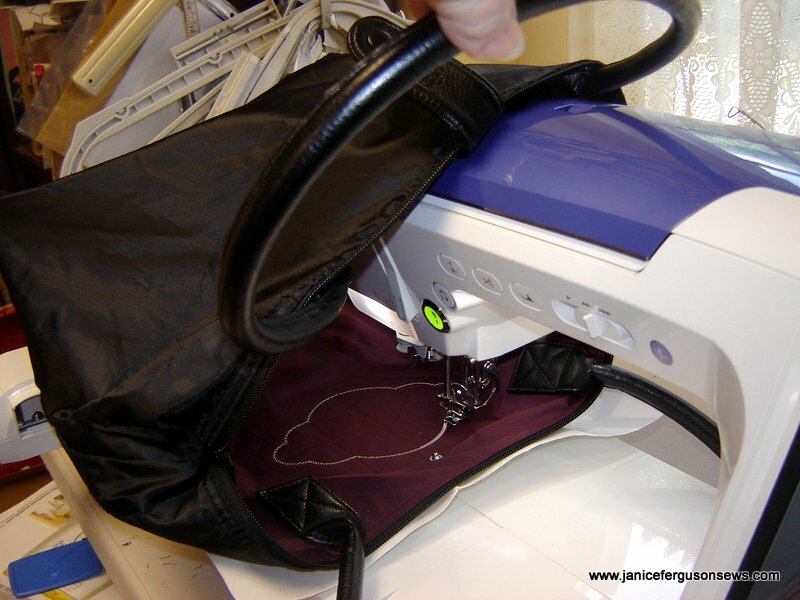 Rheeta wanted to monogram her bag, which presented a multitude of challenges for embroidery. The tote cannot be taken apart so it must be hooped inside out, basted to sticky stabilizer and stitched in what amounts to a cave. Also, the bag is lined and the layers will shift without significant basting. The Brother Quattro has a bright light over the needle as well as another over the bed. That was a tremendous help. Can you see how hard it is to change threads? 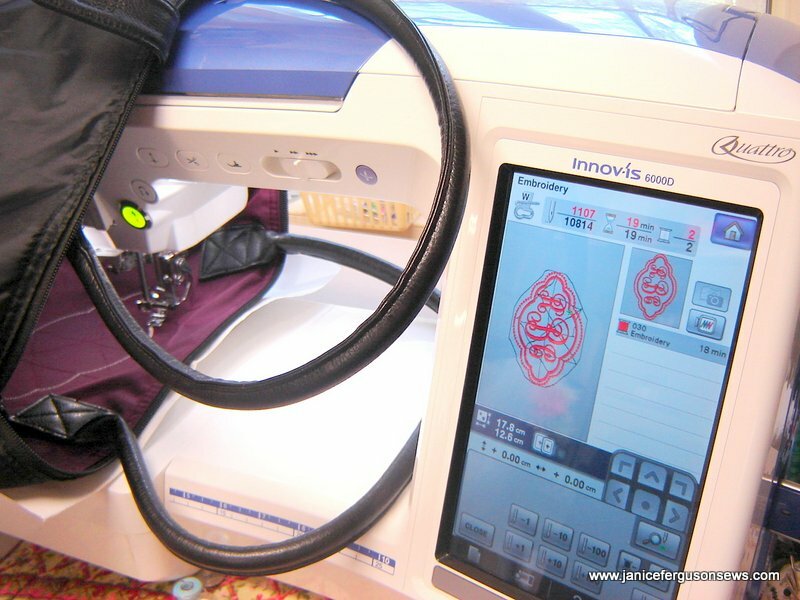 A single color design was chosen, though the basting was done in the color of the bag so that any lingering or trapped basting stitches would show. It would have been nice to drop the design a little lower, but it was too hard to work that much deeper into the bag cave. So this is what Rheeta did on her “vacation.” Though she enjoyed the gorgeous weather, she worked hard! 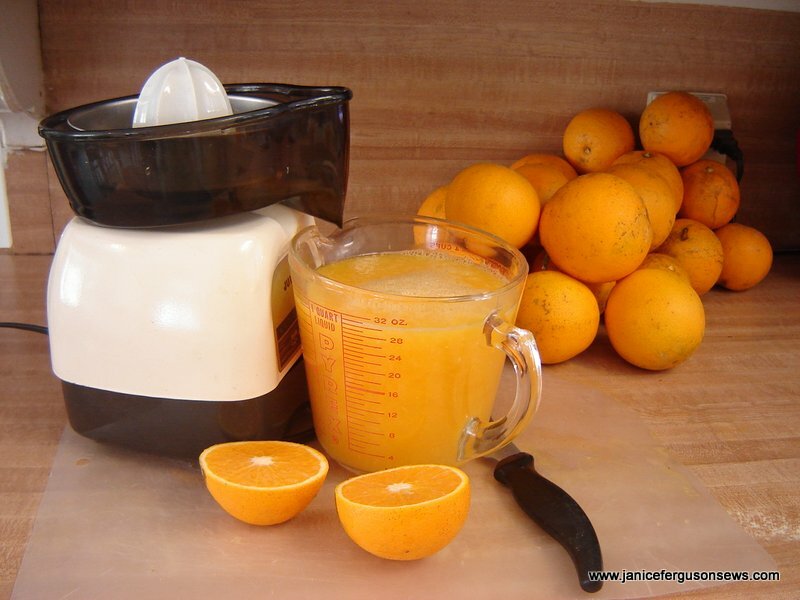 But we were regularly fortified with glasses of fresh squeezed Florida gold from our trees. Aunt Rheeta is making the 14 hour drive home now, taking with her all of these finished projects, bags of fresh picked oranges from our grove and all of our love. 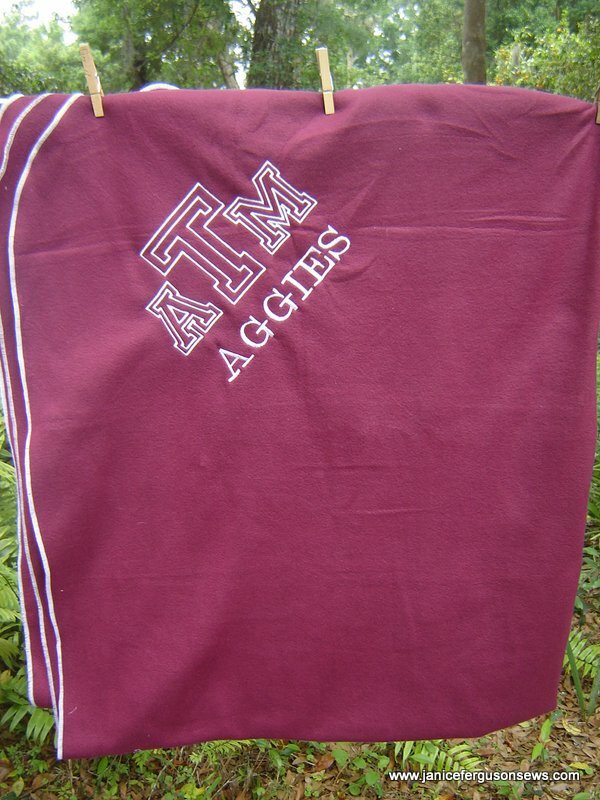 This entry was posted in bags, home dec, machine embroidery, serger and tagged Brother Quattro, embroidered recipe towels, laundry bags, machine embroidery, Mary Engelbreit embroidery, monogrammed laundry bags, monogrammed tote bag, recipe towels, Texas A & M. Bookmark the permalink. Whew! You have me worn out just reading about all of these projects! After reading about all of those great endeavors, I think I’ll take a nap and I hope you did too! Debby, we could have sewed round the clock. It was such a good time! Shirley, Aunt Rheeta was worn out before me. As a morning person, each day, she was in front of the machine by 7 a.m. As a night owl, I was there around midnight! We both could have used a nap but were having too much fun. What a very special time! Lovely work, lovely gifts. (I especially like the tipsied crown! lol). You will always treasure this time spent with your Aunt. Loved all the projects, especially the tote bag. 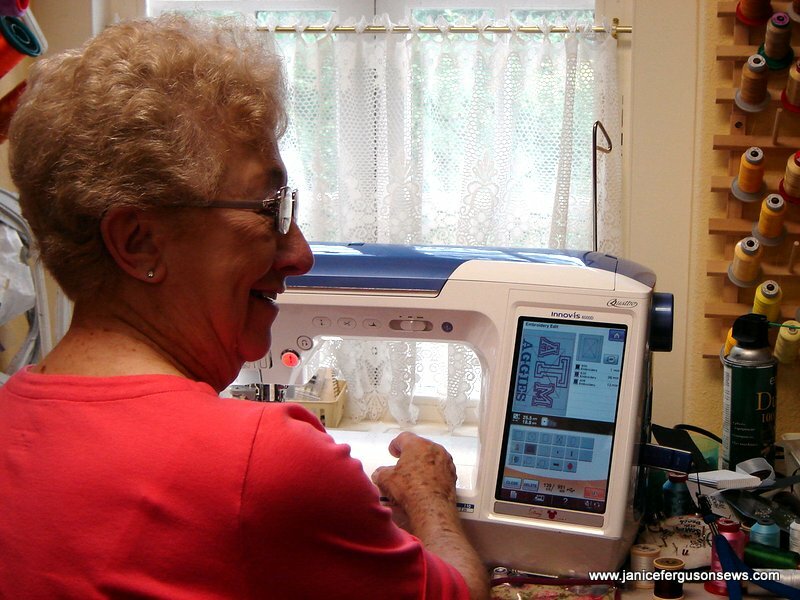 from SewForum: What beautiful projects and what a fun visit! Echo, I’m glad you like the tipsied crown. If you knew Adriana, you would know that it fits her perfectly, just as the properly placed crown fit Alexa. Bobette, that tote bag was a real challenge. But since I have about 12 of these in my stash, I’m glad we figured out how to embroider them. from Martha Pullen Forum: Looks like you both had a wonderful and creative time! from Martha Pullen forum: So much work done! Love it all! 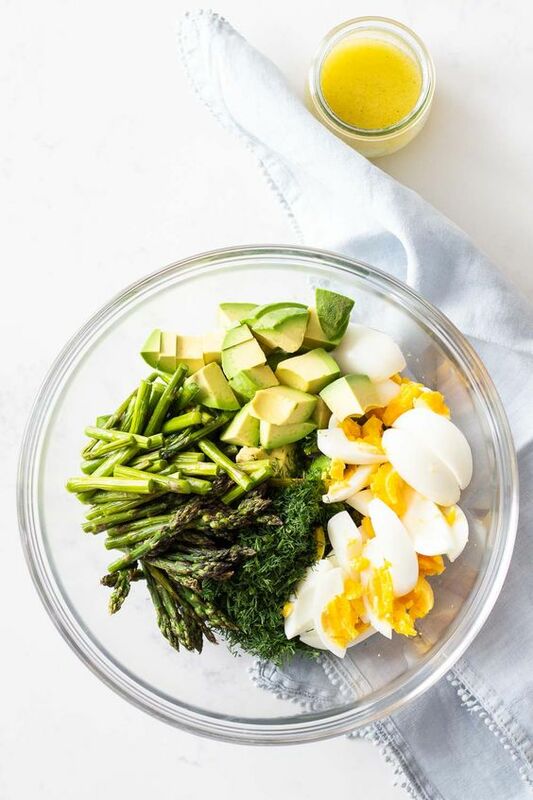 from Martha Pullen forum: Love that off-center crown! 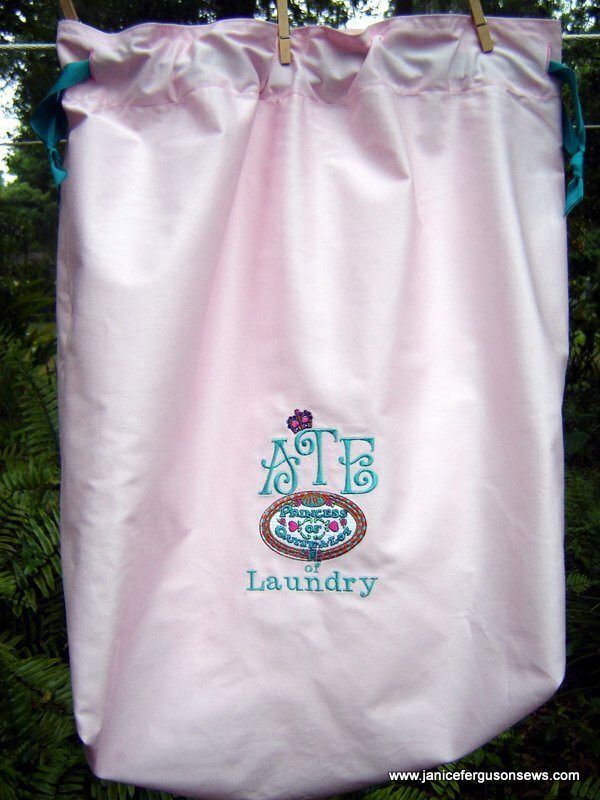 Cutest design you worked up for the laundry bags. Great work, Aunt Rheeta! 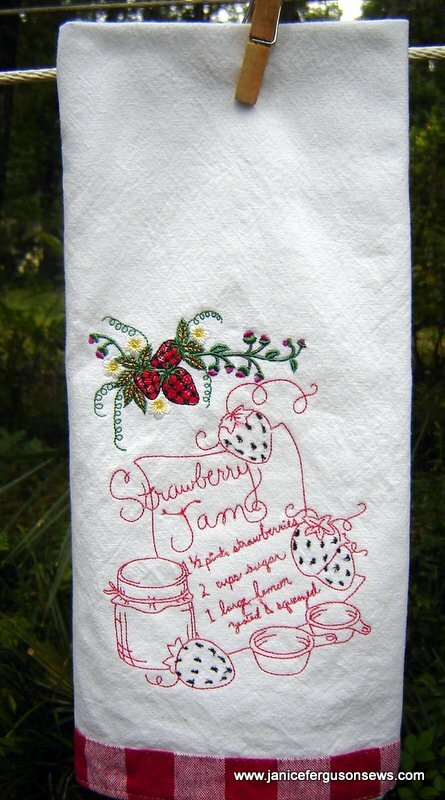 from SewForum: Such terrific projects. I am sure her granddaughter will love everything. I especially love the laundry bag! 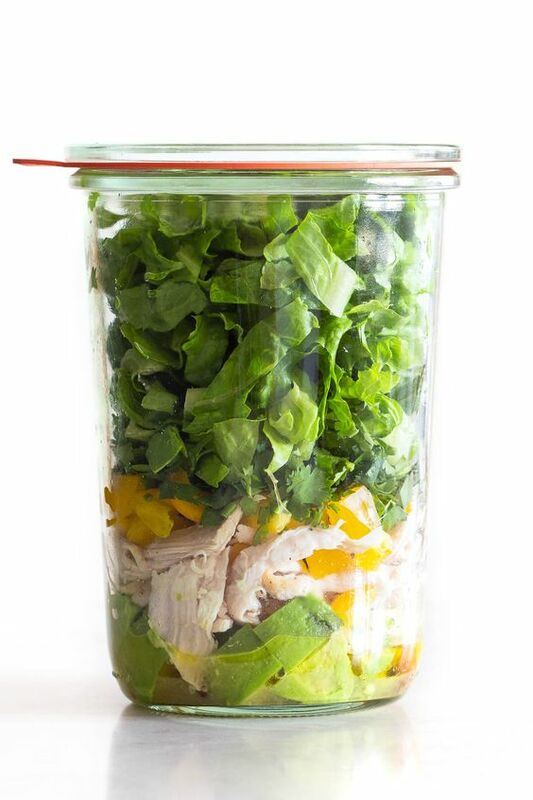 from Martha Pullen forum: All I can say is WOW, and keep up the good work Rheeta! You have truly discovered a talent and passion. 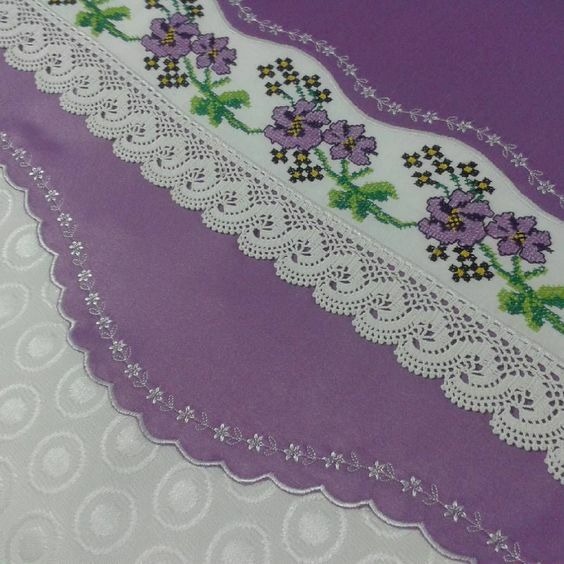 from SewForum: Amazing job. That bag looks really hard to do. 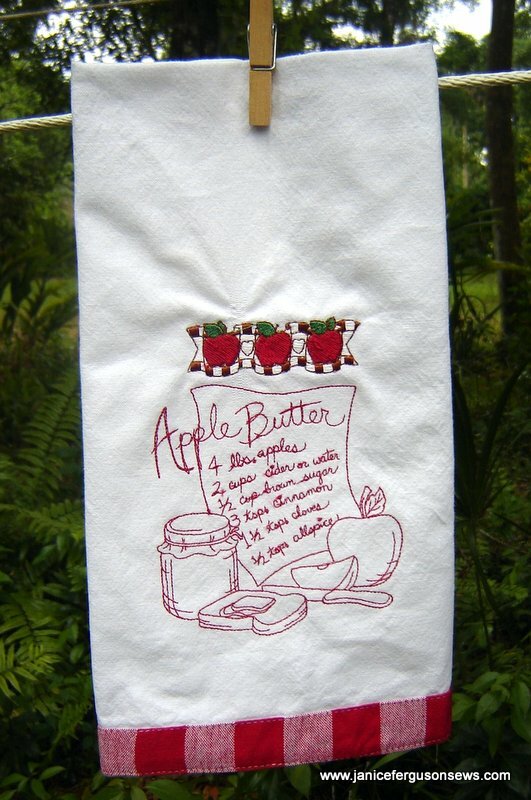 from SewForum: Great back to school projects! from Martha Pullen forum: What beautiful projects and what a fun visit! Your Aunt Rheeta is a beautiful and talented lady. You two are fortunate to have each other! Thank you, Sue. I surely do love her. from Martha Pullen forum: Well God Bless Aunty Rheeta – I love that denim laundry bag – my heart would have been in my mouth embroidering that purse – I just know I would be praying and holding my breath at the same time. I once did an umbrella for each of my sisters – I put that big design of Marilyn Monroe with the white skirt blowing for my sister Marilyn – did some shamrocks and her name for my sister Debbie and then it came to my own umbrella – I decided that I could live with it plain – there is not enough money to pay me to do another. Had the umbrella up on the back of a chair for support while I held it the whole time it was stitching – too much stress. 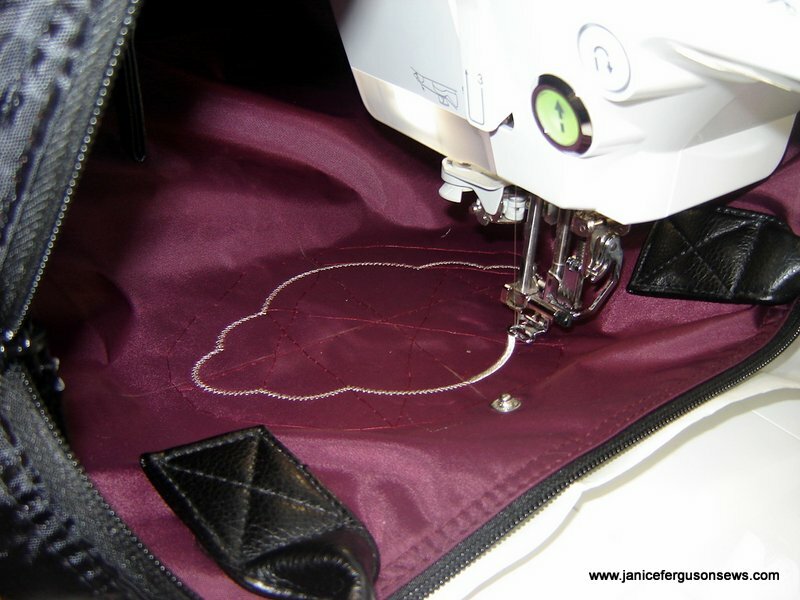 from SewForum: Great projects! Gig em! 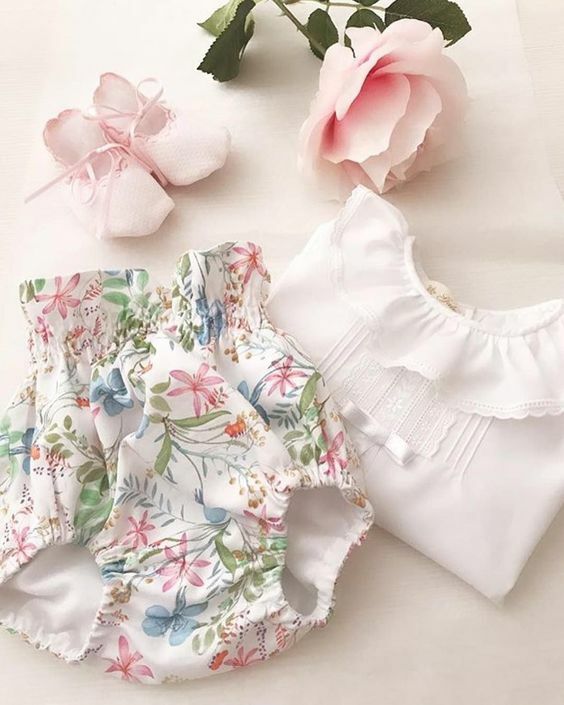 from SewForum: these are all so nice!